"Auto Shutdown" executes a user-defined OS command upon all downloads are finished by browser. This command can be used to shutdown user's computer overnight when download jobs are all finished or can be used to put your computer on hibernate to save power when there is no more downloading jobs in the queue. You can also play a song using your favorite desktop music player to get notified when all assigned downloading jobs are finished. 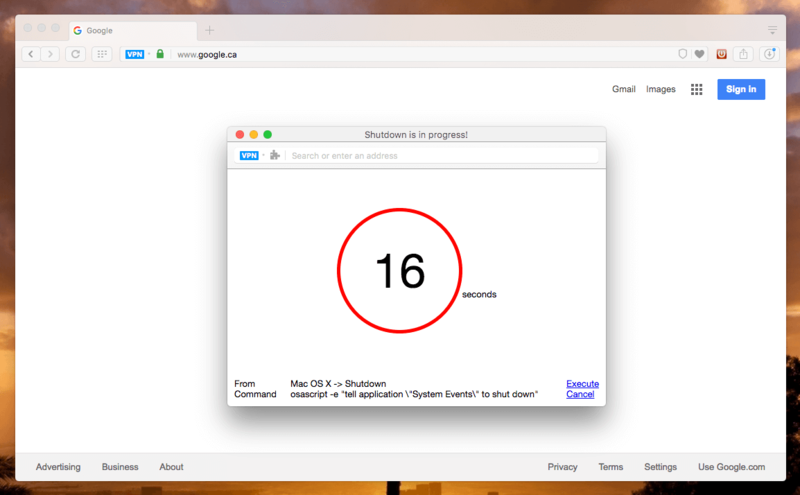 What is "Auto Shutdown" extension and how does it work? This extension observes browser download jobs and when all jobs are completed, a notification window is appeared on the screen with a countdown box. If the window is not being closed by user, an OS level command is executed. By default the extension turns your computer off. However, this command can be modified to fit your needs. In the options page pre-defined commands for following actions are available: 1. ShutDown, 2. Hibernate, 3. Restart (Reboot), 4. Suspend. Note: You can change one of these commands to do a custom operation when all downloads are finished. For instance you can bring up your media player application and play a song. What are the default commands used by this extension? Why do I need to give the installer script administrator permission on Windows OS? Is there anyway to install this script without this permission? Windows: the installer script does two things that need admin permission. It is possible to perform these steps manually to bypass the admin permission. Basically you need to create a registry entry to let your browser know where the actual program is located. So first place the "app" folder somewhere locally and then create the registry entry as describe in here (if you are going to use this app with a single browser just create a single registry entry). If your registry is pointed to the right location for "app", the extension should be able to detect the native client. Note that the installer script first checks to see if you have NodeJS in your PATH environment variable. If so NodeJS executable is not being copied. So if you are sure NodeJS is present in your system, there is no need to copy this file either. When I restart my browser the toolbar button goes back to the disabled state. Why this extension does not persist its state after session restore? Since this extension turns off your PC by default, I have decided to disable it after a restart to prevent unintentional shutdowns. You can change this behavior in the options page though. Just uncheck the options and it will remeber that last state after a reboot.